Our second appearance in this reputable news source was facilitated by Trisha Marczak, in this well-done article. We also appeared in this small blip which publicized our appearance at the senior center. Joe Orso's brilliant article on our trip. He did the interview as we passed through La Crosse on our way to the Twin Cities. Larry Lagarde started this site to advocate biking and to provide useful information on biking and bike products. He featured Fueledbyrice a couple of weeks ago. You can see his informative site here. The Saint John's Magazine features stories about interesting or inspiring exploits by alum. They currently plan to write an article about FBR for the Spring issue, which won't come out for a couple of months. Until then, you can access the Winter issue here. Adam's hometown paper, the Eden Prairie News, featured Fueled By Rice in a story they wrote September 19th. Website of the Eden Prairie News with shorter version of story. A global education magazine for college students, Abroad View features students or recent grads who make meaningful differences in other countries. The organization has a website on which FBR has been featured since October. They also have a quarterly magazine. The Spring edition will contain a story about FBR. OK, so this publication actually comes from China, but it is in English, and written by our own Adam Wolf. When he taught in China for one year, his school (Lin Xue Yuan) requested he write an article about his experience. The article predates the trip, but focuses on themes we here at FBR hold dear. Thus we are including it. Most international exposure has come from local Chinese television and newspaper. These interviews often happen on the road. We're not always able to hang around to see the stories produced. We provide it here when we have it. Otherwise we try to show the nature of the interview with our own reporting. Certainly our most biggest interview yet, Phoenix Television is a satellite TV company that is widely watched in Hong Kong, mainland China, and other places with large populations of over-seas Chinese. They interviewed us at the Mary Knoll house in Hong Kong. We haven't obtained a copy of their story, yet, but here's a picture of Drew being video taped by their cameraman. Maoming is a big small city in the southeastern part of Guangdong Province. To the north is a town called Gaozhou where we had a rest day. Little did we know, but the manager of our hotel called in reporters from Maoming the second day we stayed there. They arrived in a big van, barged into our room and filmed and snapped away. We didn't ming, because of course this is a great way to reach more people. Adam caught some footage of us being interviewed. As we biked south from Changsha, Hunan, we noticed an official looking vehicle driving beside us with a television camera. It was none other than the infamous folks from Hengyang Television. We stopped alongside the road and gave an interview with truck horns in the background. 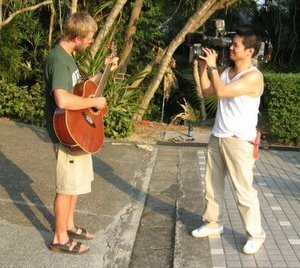 Reporters for this Changsha, Hunan, daily were alerted to our presence in the street by a friendly chocolate seller Nakia had met earlier. We had lunch with a reporter, J.J., and a photographer,Mr. Wang. They asked many questions and photographed us. We are still in communication with J.J. about getting the story. A lone reporter sought us out while we were eating in Shuyang, Jiangsu. He filmed us while we ate, and as we were biking out of town the next day. We constantly checked the website of Shuyang television for the story that presumably was made out of the footage, but the site is huge and we couldn't find it. We appreciate the hard work of the reporter anyway.